Meghan looked radiant as she was greeted at the museum. Source: Getty. She has been making headlines over the last few days thanks to her father’s cruel betrayal, after he leaked a private letter from his daughter to the media. But Meghan didn’t let it stop her performing her royal duties with her signature smile, and she looked radiant alongside her husband Prince Harry for a glamorous event on Tuesday night. The royal couple attended a gala performance of The Wider Earth to mark the 210th birthday of Charles Darwin at London’s Natural History Museum – the same venue the pair were rumoured to have enjoyed a secret date together in 2017. 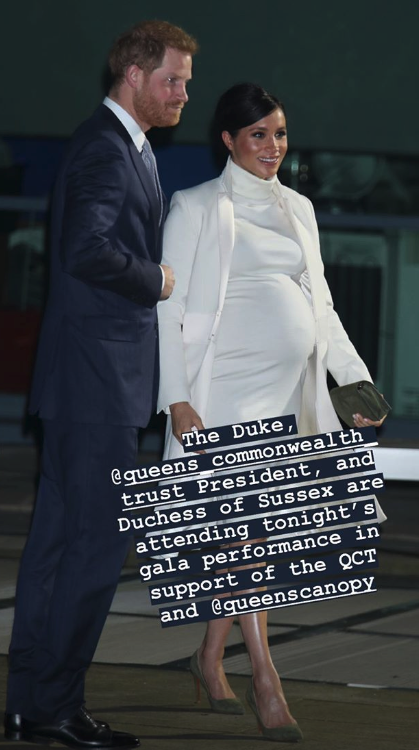 Wearing a knee-length, roll neck Calvin Klein dress and a matching coat, reportedly by Amanda Wakeley, the Duchess of Sussex looked stunning as she showed off her growing baby bump. Meghan stole the show in elegant cream. Source: Getty. Adding olive green stiletto heels and a matching clutch bag, she appeared effortlessly elegant once again for the outing and wore her hair tied back in a stylish up do. Meanwhile, her husband pulled out all the stops too in a smart navy suit and tie, standing beside Meghan’s side as they were greeted outside the venue. The claims were never confirmed at the time however by the royal family. The Duchess of Sussex was presented with a bouquet of flowers. Source: Getty. It’s been a tough few days for Meghan after her father Thomas Markle shared extracts from a heartbreaking five-page letter – which was allegedly written by the Duchess of Sussex herself – with the Mail on Sunday, showing the depths of his daughter’s grief over their estrangement. Reportedly written after her wedding, the letter accuses Thomas of “breaking her heart into a million pieces” before pleading with him to stop lying and speaking to tabloid newspapers without first trying to speak to her. “Daddy, it is with a heavy heart that I write this, not understanding why you have chosen to take this path, turning a blind eye to the pain you are causing,” the letter reads. Kensington Palace shared a photo of the royal couple as they arrived. Source: Instagram/Kensington Royal. She later hits out at Thomas for attacking Prince Harry in public, despite him always being “patient, kind and understanding” to him, before then accusing her half-sister Samantha of creating a web of lies that Thomas has simply followed. It comes after five of Meghan’s friends, who refused to be named, gave interviews to US magazine People last week, in an attempt to defend the duchess against negative reports in the media over the last few months. They were also the first people to reveal the existence of the letter and said Meghan wrote it in an attempt to mend their rift privately. Do you like Meghan’s latest outfit?